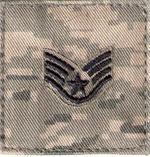 ABU TIGER STRIPE Military Name Tapes & Rank Insignia. Leather Flight Badges for all Branches of Service. We offer both Sew on Name tapes and Name tapes with hook fastener made with VELCRO® Brand Hook Fastener for the Airman Battle Uniform. 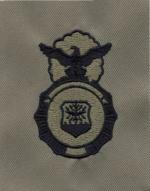 ABU HELMET BAND - OFFSET CENTER..
Embroidered Security Police Qualification badges made for ABU uniforms. 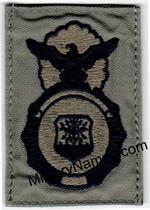 Embroidered Security Police Qualification badges made for ABU uniforms with Hook Fastener Male side Velcro.